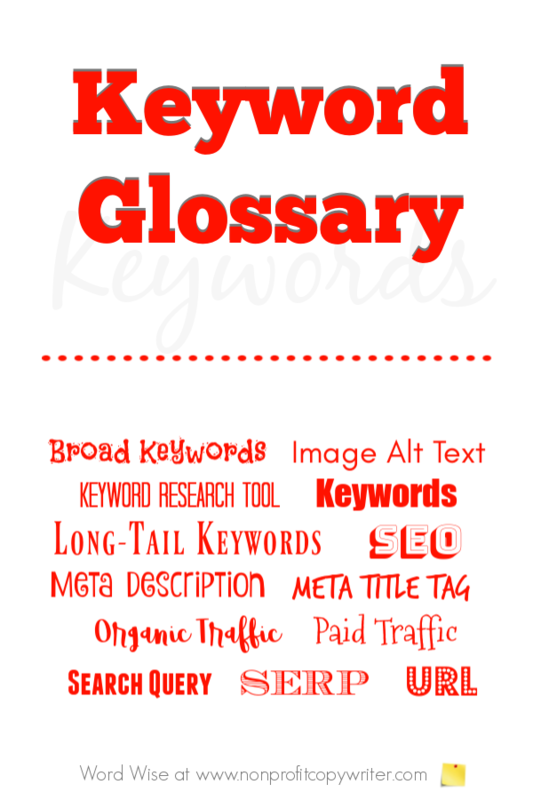 Use this keyword glossary to get up to speed quickly with SEO jargon. And you may want to check other glossaries for internet acronyms and computer-niche terms for copywriters and content writers so you can talk the talk. Image alt text: content added with an image in the back end or header of the page when it is built. The image alt text (“image alternative text”) includes the page’s keyword so that search engines can understand what the image shows and to give readers an explanation if images cannot be found. Keyword research tool: free or fee-based tools that help you find relevant keywords for your topic. These tools can return data that show you how many users are searching for those terms and how many pages already use that term – in other words, what kind of competition your page may have in search results. Google Keyword Planner is free to users. You can try fee-based Wordtracker free for 7 days. Long-tail keywords: two- to five-word phrases (hence the “long tail”) that are very topic-specific. Long-tail keywords may draw lower search volume results but often lower supply. Long-tail keywords give you an opening to provide specific content for your readers. Meta description: a summary of the page’s content, added in the back end or header of the page when it is built. It is the snippet of content that appears below a page link in search results. The meta description contains the page’s keywords. Meta title tag: content that appears as the page title in the web browser. The title tag includes the page’s keywords and is added in the back end or header of the page when it is built. Organic traffic: visitors that come to your site as a result of a search. Paid traffic: also called direct traffic, these are visitors that come to your site as a result of an ad. Search query: a reader’s request to a search engine for information. SEO: acronym for “search engine optimization,” the process of writing and formatting a page for the web to return strong results in web searches and drive more organic traffic to a website. SERP: an acronym for “search engine results page,” a web page that appears in your browser after you conduct a search query. A SERP gives you a listing of pages on the web that are most relevant, in descending order, for the term you typed into your search engine. URL: an acronym for Uniform Research Locator, but what we commonly call a web address. The URL specifies where the page is located – its address – on the computer network where it “lives.” For instance, this page’s URL is www.nonprofitcopywriter.com/keyword-glossary.